Skeletons don't have to be creepy. In fact, they can be adorable. 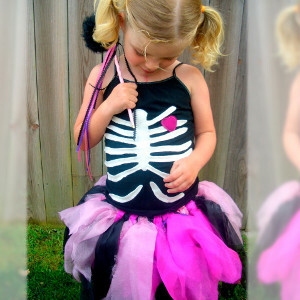 Simply make the Girly Skeleton Homemade Halloween Costume, and you'll change everyone's mind about skeletons. Halloween costume ideas for kids can be expensive, but this simple tutorial will show you how to keep things cheap, cute, and crafty. It's important to choose original Halloween costume ideas like this one so that your costume is unique and prize worthy. You'll be thrilled that you made homemade Halloween costumes when you walk away from the costume contest a winner. 1.) 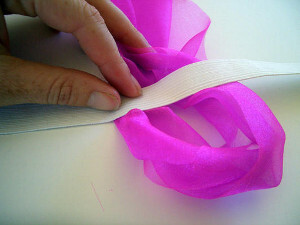 To make the fairy tutu, cut organza into strips approx. 20” long and 4” wide. 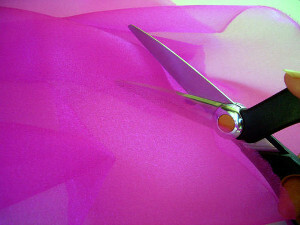 Use the Fiskars’ Razor Edge Soft Grip scissors, which can just slice up the organza without the need for actual snipping. This makes the job much quicker, which is helpful because you will need a lot of these. Cut the ends of all the strips into triangular points. 2.) 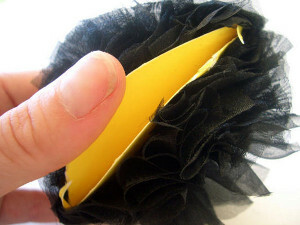 For the waistband of the tutu, measure some elastic (mine was ¾” wide) around your child's waist so that it stretches comfortably around her. Sew the two ends of the elastic together to form a loop. 3.) 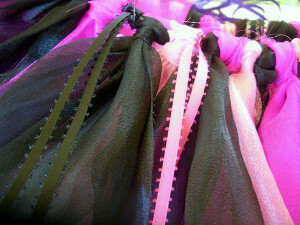 Next, tie the organza strips onto the elastic. First fold the organza in half and put the loop of the fold underneath the elastic. Then bring the two ends of the fabric up over the elastic and through the loop and pull tightly. The more strips you add, the fuller the skirt. 4.) 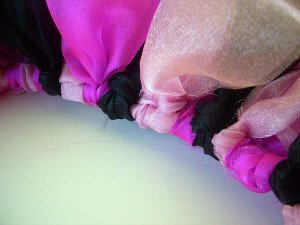 To complete the skirt, add some ribbons, tied on in the same manner as the organza. 5.) 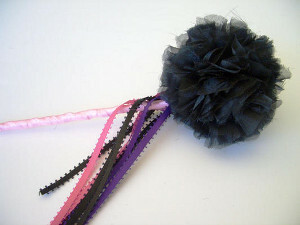 Make a wand with an organza pom pom for the tip. Used a Fiskars circle template set and draw around the largest circle on cardstock. 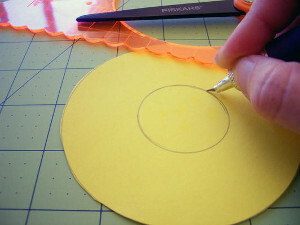 Then use the second smallest circle for the center and cut it out using a craft knife. 6.) 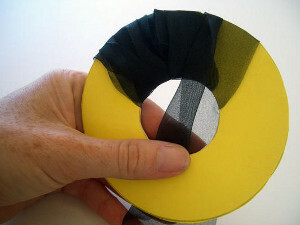 Make two ‘donuts’ from cardstock, then hold them together as you begin to thread an organza strip through the middle and around the outside edge. Tie several strips together to create enough length to go all the way around the ring a couple of times. Pom poms are very forgiving and hide any knots you need to make as you join strips together. 7.) After going around the circle a couple of times, take sharp Microtip Scissors No. 5, which are able to get into places other scissors cannot reach, and snip through the organza, right between the two cardboard rings. Before completely removing the rings, tie some ribbon several times around the center of the pom pom as tightly as possible to secure it. 8.) Then tie the pom pom onto a length of dowel that had been covered with ribbon. I tied a few more ribbons around the base of the pom pom for added magic powers. 9.) For the skeleton ribs top, image search and find a rib cage template. Print it, cut it out and use it as a pattern to cut white felt. Another option would be to use the template as a stencil and use white fabric paint to paint onto a black top. 10.) 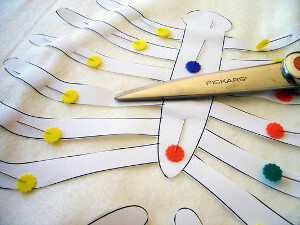 Pin the felt rib cage onto a black top and sew it on. 11.) To finish, use a Fiskars heart lever punch to make a pattern for a heart shape on a piece of bright pink felt. Sew this over the top of the rib cage.